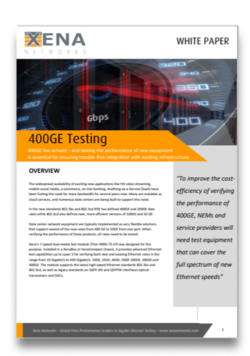 Want to test the performance of 400GE products and services? Need a fully-featured 400GE traffic generator and analysis solution that supports both 400GE, 200GE and all the slower speeds? It’s here. Learn more about Xena’s advanced 400GE test solutions now. Valkyrie is Xena’s Layer 2-3 Test Platform for generating and analyzing stateless Ethernet traffic up to 400Gbps. Valkyrie is flexible, scalable and offers extreme accuracy. Every system comes complete with Xena’s famous “value pack” of free software, three year’s free SW updates, three year’s free HW warranty and free tech support for the lifetime of the product. Including the industry’s best test automation options, Valkyrie delivers incredible value. This is Xena’s Layer 4-7 Test Platform. Vulcan makes it easy to generate stateful Layer 4-7 Ethernet traffic to analyze the performance of networking devices and infrastructure in real-world scenarios. It is ideal for validating firewalls, switches, routers, NAT routers, proxies, bandwidth-shapers and more. Discover how Xena's easy-to-use Gig-E test solutions can meet your needs - without breaking your budget. Valkyrie is a stateless Ethernet traffic generation and analysis platform that supports all types of performance, QoS, conformance and functional testing at all speeds up to 400GE. Vulcan generates stateful Ethernet traffic to analyze how firewalls, switches, routers, NAT routers, proxies, load-balancers, bandwidth shapers and so on perform in a wide range of real-world scenarios. Vantage is a robust “point-and-click” Ethernet production line test solution for networking devices such as switches, NICs, routers, GPON devices, cable modems, EOC, power modems and so on. Safire makes it easy to test the performance of enterprise-class firewalls – when enabling features like antivirus, app-control, IPS and SSL decryption – and document the results in “read-at-a-glance” PDF reports. Chimera is an extremely cost-effective solution for emulating different forms of impairment (e.g. latency and jitter, bandwidth control and shaping) between DUTs in the lab – at rates from 10GE to 100GE. The latest generation of data center equipment support the new 400GE and 200GE data rates as well as the slower speeds right down to 10GE – all via the same port. All rates need to be tested, and this poses rigorous demands on traffic generation and analysis solutions. This White Paper analyzes what is required for cost-effectively verifying the performance of network equipment that supports 400GE and 200GE. Time synchronization of test instruments far apart is required to make one-way latency measurements and multi-site protocol analysis. 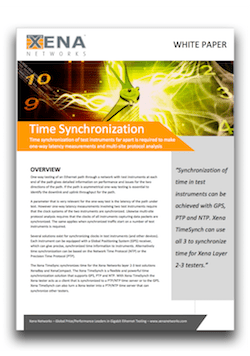 This White Paper explains how synchronization of time in test instruments can be achieved with GPS, PTP and NTP. ValkyrieTimeSynch can use all 3 to synchronize time for Xena Valkyrie Layer 2-3 testers. 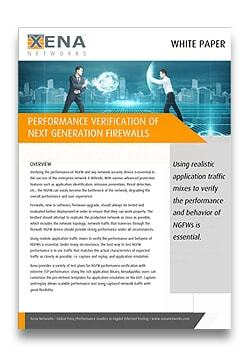 To rigorously test the performance of next generation firewalls (NGFWs), it is no longer enough to bombard them with dummy traffic. That’s why Xena developed an advanced L4-7 traffic generation solution for emulating highly realistic traffic streams that can be scaled to millions of users – including a free library of up-to-date application traffic in pcap format. The automotive industry is finally going digital. 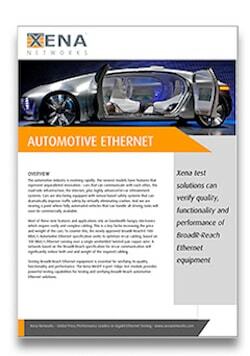 Initiatives like the BroadR-Reach 100 Mbit/s Automotive Ethernet standard seek to minimize the weight and cost of electrical cabling – now the 3rd largest weight component. Xena test solutions are ideal for verifying the effectiveness of these initiatives. Read more. Testing with realistic network traffic places the device under test (DUT) in a realistic network environment and delivers authentic results. 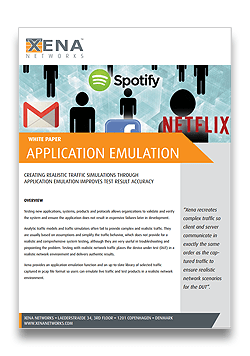 Xena Networks provides an application emulation function and an up-to-date library of selected traffic captured in pcap file format so users can emulate live traffic and test products in a realistic network environment. 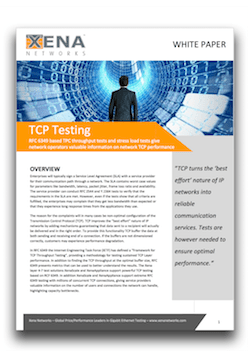 TCP turns the ‘best effort’ nature of IP networks into reliable communication services. Tests are however needed to ensure optimal performance. This White Paper explains how RFC 6349 based TCP throughput tests and stress load tests give network operators valuable information on network TCP performance.